Scottsdale, Arizona—A single-vehicle rollover accident on the Beeline Highway yesterday left two people dead and four others with serious injuries. Rafael Rosa, age 19, was driving an SUV southbound on SR-87 when he lost control of the vehicle and crossed over the median before entering the northbound lanes of rolling. Mr. Rosa was killed, as was Esmeralda Rojas, age 19, who was ejected when the vehicle rolled. Four other passengers in the vehicle were hospitalized with various injuries. 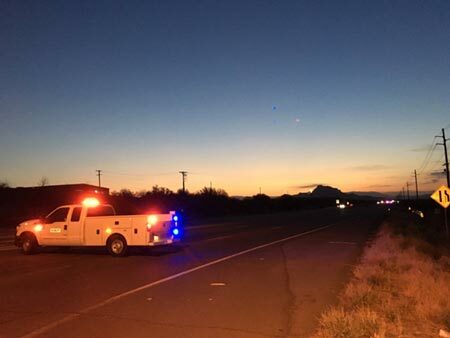 Accident investigators with the Arizona Department of Public Safety have described them as a 20-year-old woman from Apache Junction, a 17-year-old boy from Mesa, a 17-year old girl from Mesa, and a 9-year-old boy from Mesa. The 17-year-old girl and 9-year-old boy were treated and released. The other two remain hospitalized. We offer our condolences to Mr. Rosa and Ms. Rojas' family and friends and wish speedy and complete recoveries to the four who were injured.